In high school, CIERA physics and astronomy graduate student Zachary Hafen didn’t necessarily find science interesting. Intrigued by its open-ended nature, he planned to study philosophy as an undergraduate. 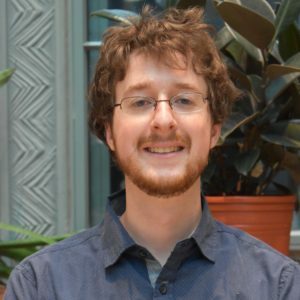 As a Reach for the Stars fellow at CIERA, Hafen developed “Vault”, a program where he supports student-led data expeditions in collaboration with Chicago Public Schools to bring research experiences to high school students. With only 10,000 labs in high schools across the U.S. to provide for more than 30 million high school students, the chance of having the tools to discover something unique in high school is low. Vault is an opportunity for students to dive deeply into a subject that they care about with the support of Hafen as a mentor, guiding them through the research process and helping them answer questions in the same way researchers would. Hafen has been preparing the project for three years, and began implementing it last fall. Currently, he meets weekly with more than 15 high school students at the Northwestern Academy for Chicago Public Schools to discuss groups’ progress and advise students as challenges arise. From investigating how socioeconomic and cultural factors relate to healthcare access across Chicago to working out all the details on how humans can survive on Mars, students are working with each other to utilize available data exploring topics they’re interested in and producing real, concise answers. Some of the students have gone on to attend Northwestern University or continue their research career with professors at Northwestern. Hafen said that the thought that one day there can be students enjoying science in the same way that he does is greatly fulfilling.